WHAT OPTIONS ARE THERE FOR MY WATERFRONT? 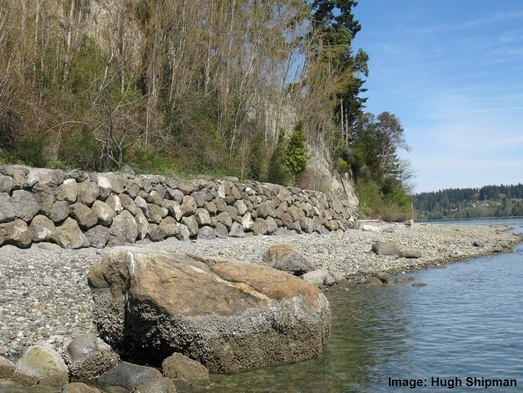 Yet, if conditions are right, removing shoreline armor can enhance the natural beauty of your property, improve access to your beach, and help protect the health of Puget Sound - without sacrificing protection from erosion." ﻿﻿ WHY ARE BULKHEADS A CONCERN? 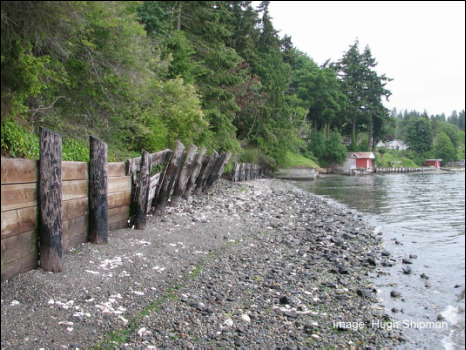 ​Many marine waterfront properties in Mason County have bulkheads or other types of shoreline armor that were installed years earlier. "Hard shoreline armor" refers to waterfront walls made from cast concrete, rock, creosote, piles of broken concrete, old tires, railroad ties, and other materials that were installed to slow or stop erosion. Today we know that bulkheads are not always the best (or the only) option for dealing with erosion. This is good news for Puget Sound. Why? Well, we better understand that coastal erosion is actually a valuable process for maintaining the health of Puget Sound. Over time, erosion provides the sediment that creates and maintains the beautiful beaches that we enjoy so much. However, shoreline armor like bulkheads interferes with the process of sediment deposition, "starving" beaches and changing their form - and even their ability to support marine species. Hard shoreline armor can also cause other unintended problems such as accelerated beach erosion, eventually undermining the stability of the armor itself. It also leaches toxic chemicals from creosote and heavy metals from pressure treated wood into the water. WHAT OPTIONS ARE THERE FOR WATERFRONT PROPERTIES WITH BULKHEADS? In some situations, it may be possible to remove a bulkhead completely or to replace it with a "soft shoreline stabilization" alternative that slows down erosion - but also provides valuable habitat. 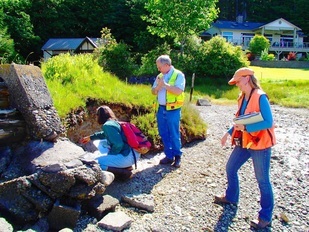 In other cases, shoreline armor may be too risky to remove, but there are ways you can help to improve environmental conditions on your shoreline. We can help you assess whether a bulkhead alternative - or even a removal project - might work for your waterfront. If such a project is feasible, we can discuss the options available to you, including potential sources of funding for removal. Even if shoreline armor can't be removed, there are still steps you can take to support the health of Puget Sound. See examples of bulkhead alternatives at the bottom of this page - or click the button below to open a separate page. ​​ I HAVE A FAILING BULKHEAD THAT NEEDS TO BE REPLACED OR REMOVED. Bulkheads are often a legacy from the past, installed because they were considered the best option at the time. Today we know that there are alternatives. To assess if armor removal or if "softer" alternatives are feasible at your property, a site-specific determination is needed. In some cases, particularly sites with very high erosion rates, it may not be possible to remove shoreline armor. In other cases, waterfront armor can be completely or partially removed and either left natural, or stabilized with an alternative technique. Even when armor can't be removed there are still ways that you can enhance habitat conditions along your shoreline. Call us or schedule a visit with our shoreline specialists to learn more. Are you thinking about replacing a failing bulkhead? It may not be necessary to spend thousands of dollars to replace old, failing waterfront armor. Depending on site conditions at your specific property, you may simply be able to remove part or all of the armor and replant the bank. In other cases, a soft shoreline stabilization alternative might be combined with armor removal. We are available to answer questions and help you understand the various strategies that might work for your property. I WANT TO REMOVE MY BULKHEAD. I OWN UNDEVELOPED LAND WITH A BULKHEAD. ​If you have an old bulkhead that isn’t necessary to protect your home and you want to explore options for removing it, let us know. We can come out to assess your waterfront and discuss removal options, as well as funding opportunities and other resources to help you achieve your goals. Undeveloped waterfront properties with old shoreline armor are often ideal locations for removal projects. In such cases, the bulkhead can be removed with ease because of a lack of structures. These sites have an additional genuine advantage: you can plan ahead and locate future buildings at a safe setback distance from the water's edge, avoiding the need for future shoreline modification entirely - and saving thousands of dollars. Contact us if you want to explore armor removal and shoreline options for a property like this. 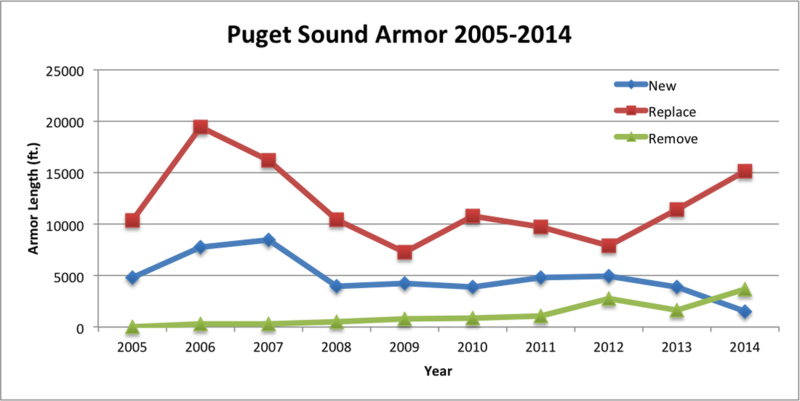 WHAT HAS BEEN HAPPENING WITH SHORELINE ARMOR AROUND PUGET SOUND? 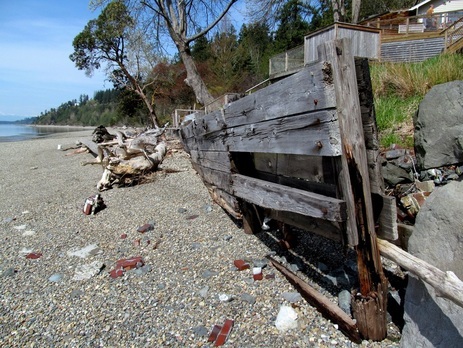 Did you know that Mason County is one of the Puget Sound counties with the highest percentage of shoreline armor? Along with more urban counties like King, Pierce, Snohomish, Thurston, and Kitsap, rural Mason County's shoreline is more than 50% armored. * Unfortunately this legacy of shoreline armor wasn't the most practical choice for every property - many of these properties have little or no erosion risk. " Alternatives to bulkheads and other types of hard shoreline armor are called "soft shore protection" or "soft shoreline stabilization" methods. These engineered projects are installed where site conditions are appropriate and where erosion poses a risk to a home or critical infrastructure, but can be addressed using alternative methods. These methods were developed and refined by coastal engineers to maximize protection from erosion and minimize environmental impact on natural processes and habitats. Such projects are appropriate for sites where the conditions for success are right - and should only be installed when important infrastructure or homes are at risk. We offer free, non-regulatory guidance to local homeowners. Sign up for a site visit that gauges your erosion risk and points you to the resources you need. The creation of the Shore Friendly Mason pages of this website were made possible by grant funding. We would like to thank the United States Environmental Protection Agency and WA Department of Fish and Wildlife for their support. This project has been funded wholly or in part by the United States Environmental Protection Agency under assistance agreement PC 00J29801 to Washington Department of Fish and Wildlife. The contents of this document do not necessarily reflect the view and policies of the Environmental Protection Agency, nor does mention of trade names or commercial products constitute endorsement or recommendation for use. "